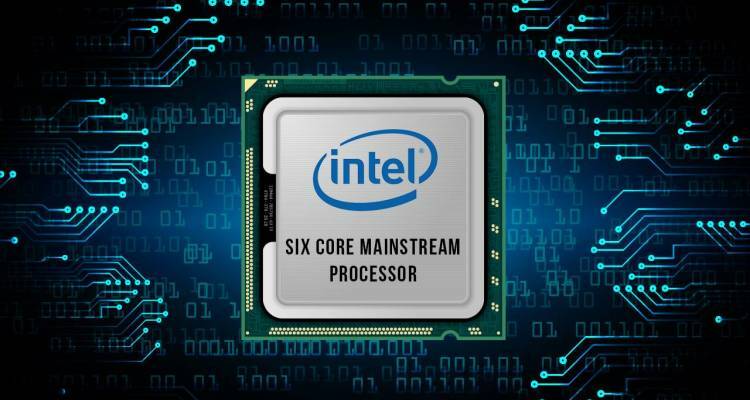 We already have the complete specifications of the Core i5 and Core i7 processors under the Coffee Lake architecture, where the important news is that all these CPUs are 6 cores, the most palpable difference being the HyperThreading offered by Core i7. 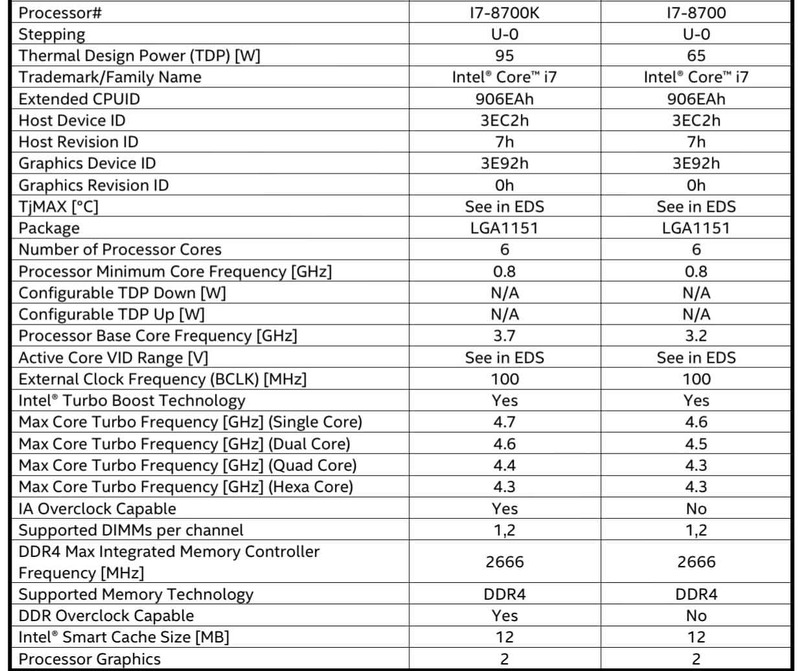 Top of the range is Intel Core i7-8700K with 6 cores and 12 threads at a Base / Turbo frequency of 3.70 / 4.30 GHz, additionally having several additional Turbo modes: 4.30 GHz for 4 cores, 4.60 GHz for 2 cores and 4.70 GHz for a single core. Its TDP is 95W. The Core i7-8700 is the same CPU turned down and locked for Overclocking with a frequency of 3.20 / 4.30 GHz (4x @ 4.30 GHz, 2x 4.50 GHz, 1x 4.60 GHz) its TDP drops down to a more comfortable 65W. With the Intel Core i5-8600K we reached the 6 cores and 6 threads processor at a Base / Turbo frequency of 3.60 / 4.10 GHz offering 4.20 GHz for four / two cores and 4.30 GHz for a single core with a TDP 95W. 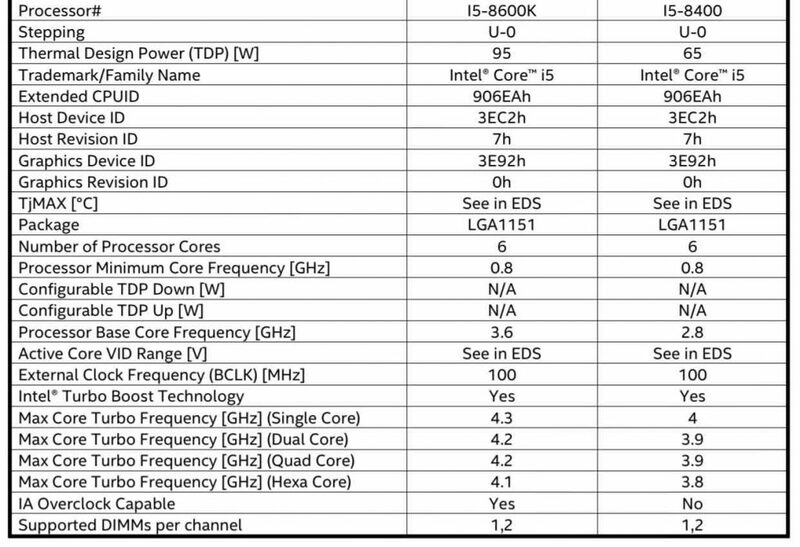 The Core i5-8400 lowers its Base / Turbo @ 2.80 / 3.80 GHz (4x 3.90 GHz, 2x 3.90 GHz, 1x 4.00 GHz) frequency with a 65W TDP. It should be remembered that these CPUs are for the Intel LGA1151 socket and hopefully it will support current Z170 and Z270 motherboards simply by updating the BIOS.